176 pages | 8 B/W Illus. Market reform promises more environmental protection and more profitable agriculture at lower financial cost. Too good to be true? This book examines numerous empirical examples of policy in action to identify principles for the successful application of market-based policy instruments. Where some market instruments are used to fix market failures by putting a value on environmental protection, others use market-like mechanisms to allocate financial incentives for environmental work. They are promoted as flexible, efficient and politically neutral solutions to the competing demands of social, economic and ecological sustainability. But they also attract criticism for rolling back environmental regulation and privatizing public goods. This book argues that while many market-based instruments have merit, decisions about responsibility cannot be left entirely to the market. Whichever instruments we use, decision-making needs to be embedded in a logic of democratization. Using case studies from around the world, this book investigates how instruments like eco-standards, payments for ecosystem services, pollution trading and community-based natural resource management perform in practice, and what can be learned about applying them more effectively. While the approach is primarily sociological, it is deliberately written to bridge the gap between sociology, economics, environmental science, and the concerns of environmental policy makers. "Although written by an environmental sociologist this is a book aimed at all those interested in formulating more sustainable social and economic policy, crossing disciplinary lines and delivering a message of hopeful optimism in an increasingly divided and dystopian world. 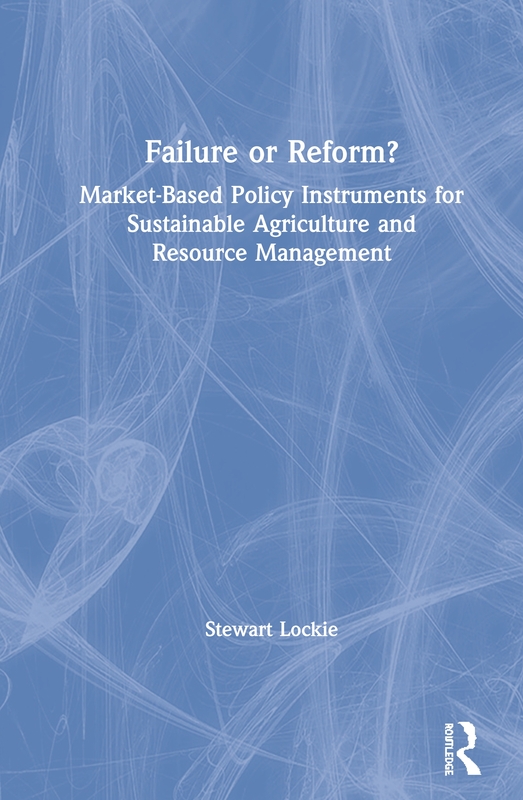 Lockie demonstrates how environmental policy can draw on multiple methodologies, including market mechanisms, while asserting that it needs to be firmly located within a framework of democracy and accountability. It is a must-read in the twenty-first century…"
"This volume provides a thoughtful analysis on how and under what conditions market-based approaches do – and do not - support sustainable agriculture and resource management. A balanced, well-written and informative argument for scholars, governments, communities and the private sector to move beyond market ideologies." "A systematic, well-documented and convincing argument that market instruments are necessary but not sufficient tools to deal with agri-environmental challenges and the global climate crisis." Stewart Lockie is Distinguished Professor of Sociology and Director of the Cairns Institute at James Cook University. He is Editor-in-Chief of Environmental Sociology and a Fellow of the Academy of the Social Sciences in Australia. Professor Lockie’s research addresses natural resource management, food and agriculture, sustainable development and climate adaptation.